Dr. L. Christine Oliver is an Associate Professor of Clinical Medicine at Harvard Medical School and Co-Director of Occupational and Environmental Medicine at Massachusetts General Hospital. This is an excellent half hour presentation. Dr Oliver packs so much about the issues faced by people with MCS into the first 16 minutes of this video. If you can’t watch the whole video, at least watch this much. Alison Johnson finishes off by reading from her important book Amputated Lives. 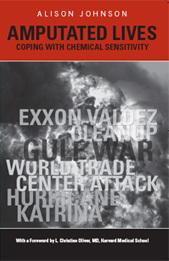 Alison Johnson is the author/producer/director of books and documentaries on Multiple Chemical Sensitivity. Visit http://www.alisonjohnsonmcs.com to download a transcript or to purchase her books or DVDs. This entry was posted in Accessibility, Disability, Environmental Health, Health Care, Multiple Chemical Sensitivities, Public Health and tagged chemical exposures, environmental sensitivities, Fragrance, fragrance-free policy, health, health care access for people with MCS/ES, Housing, indoor air quality, MCS and CDC, MCS video, MCS/ES, sensitive to pollution, smoke-free, suicide, video. Bookmark the permalink. This is very good and great to share in may. as a the canary in the coalmine I can say this is very very well done. I have shared and shared thank you. Thank you for posting this lecture! I’ve been dealing with Chemical Sensitivity for almost 17 years, fighting to have it recognized all that time. I’ve lost an international speaking career, a publishing career, my social and other professional life, and most of my income. How welcome it is to learn that I am not alone! We are not alone. According to research, 3-30% of the population is “sensitive” to chemical pollution, and the numbers are growing. Thank goodness for the internet! It is allowing us to find each other and those who are working hard to make the world a safer place for all of us. She covers so much. Oh, fragrance free policies: something i dream of! It’s so good to see so much information getting out there. Here is a link to the story of a young woman over here in Australia: http://www.todaytonightadelaide.com.au/stories/heal-amelia She has it tough but she is so brave. The media were respectful rather than sensational in covering the story, I thought. Which says a lot about were we are at with this. I was very happy to read about your success with the Uni accommodating your needs and making it possible for you to attend your classes! I think it won’t be too much longer before it is no longer acceptable to pollute any indoor air (or anything, actually) with toxic chemicals of any kind (smoke, fragrance, furnishings, etc etc). I also applaud all those who care for and about everyone who has a disabling (and economically controversial) medical condition, despite the efforts of most corporate owned media and “professionals” to dismiss the truth so that polluters can continue to pollute without paying or being forced to clean up their mess and stop polluting and selling products that harm people and the environment we all depend on for life. Thank you, Linda. I find your words so encouraging. It’s so nice to picture a world where it’s not acceptable to pollute indoor air. Last week I found out that I have passed, and am now the proud owner of a Diploma! I’ve been offered an Art Degree placement, however, I’m trying to defer for at least a year. To be honest, even though I’ve been lucky with VU, I’m finding just the thought of asking one more person to go FF very stressful. I need the time off. Even thought I was only doing one class a week, sometimes it would take the whole week just to recover… Washing powders, carpet, the car trip: there was always something to tip me. I do like having something to complete and keep my mind occupied. It’s an escape from this life, I suppose. I’ve not been anywhere at all for weeks now, except for driving to go for a walk with Bella, which has given me some respite from chemical exposures and all that entails. It’s tempting to just keep doing this… Anyway, I’m sending you something via PM on FB as soon as I can. Wonderful that you were able to survive the Diploma process! And what is it about washing powders (even the unscented ones) that makes them so much worse than some liquids? I hope you can find fulfilling things to do. Having places to walk without being overcome by chemical fumes is really special. I miss that so much. And the disabling exposures are systemic now! So much of he progress made in the 90s to address IAQ and health effects was lost. And we can’t live without being involved with other people. How do we get food without other people being involved? How do we get food that hasn’t been kept in a fragrance polluted environment, or touched by hands with fragrance chemicals, or that isn’t stored in toxic packaging or in packaging that absorbs the toxic chemicals? Where is all the medically required safe housing? Where is the accessible health care? Where are the fragrance free, non-toxic supply chains for food, clothing, toilet paper, and other daily needs? Where are the safe-out-of-the-box (non toxic, low EMF, no wireless RF) appliances (washers, dryers, vacuum cleaners, blenders, dehumidifiers, humidifiers, air conditioners, heaters, fridges, ovens, telephones, cameras, lamps, and computers we need? Even some air purifiers are made with toxic materials, fer ____s sake! Kids are living a pre-polluted life now. So many have complex health problems because of this toxic soup. If the MCS/ES Canaries had been listened to back in the 80s and early 90s, (and Rachel Carson and others before that) and if preventative actions had been taken then, we wouldn’t be seeing provinces where 50% of their budget is for health “care” that doesn’t even serve a significant percentage of the population! Can we get enough people willing to put a stop to the insane practice of polluting for profit? Linda thank you for this website, for the courage, strength and passion/compassion it takes to create such a great resource. My ME/CFS org, AIME (Alberta Initiative for Myalgic Encephalomyelitis), may use some of these resources, and I know I will personally, for sure. Environmental health issues are so rarely addressed in the mainstream, especially in any way that connects the information to real lives… I try to do a little of that here… and make it a bit easier for people to do some research themselves if they so choose (or have the energy to), although my own brain fog has prevented me from really organizing things as well as I would like to here. I hope to be able to do more simplifying eventually. I wish you much success with your project and hope the people of Alberta can work together to finally make proper care happen for so many who are suffering now. Please be sure to check out the material in the post Report: RECOGNITION, INCLUSION AND EQUITY – THE TIME IS NOW, a project here in Ontario that should make it easier for all provinces and jurisdictions to adopt appropriate and accessible health services for those of us who aren’t being served in the current system.